Only two Toronto neighbourhoods with garden-themed names come to my mind. One is Rosedale, north of Bloor Street edged on the east by the forested slopes of the Don Valley. Its winding streets are lined with grand, historic mansions. Rosedale got its name from the profusion of wild roses that once grew on the hillsides there. Then, almost cheek-by-jowl to Rosedale, south of Bloor Street, is Cabbagetown. Its name came from the fact that in Victorian times, the original residents – mostly poor Irish immigrants – used every scrap of land, even their front gardens, to grow vegetables. Cabbages (and the smell of them cooking) were the most obvious, hence the pejorative Cabbage Town. The world has come full circle, as front-yard vegetable gardens are making news, even in front of fancier homes. Cabbage Town has become Cabbagetown, said with pride of place. With its pretty Victorian cottages, it’s now a desirable place to live, yet still down to earth and a little rough around its edges. In this appropriately garden-themed area yesterday, I met up with peripatetic British garden blogger – Charlotte, The Galloping Gardener – for a glass of wine at The Cobourg on Parliament Street. It’s a thrill to give a virtual relationship a face and voice. 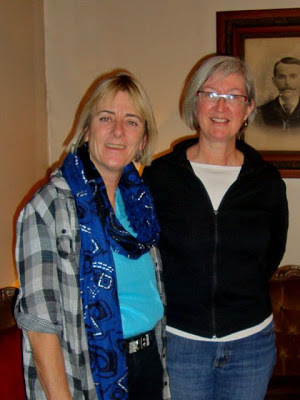 We caught up after her visit to Niagara Falls – although rain did a big Niagara act just as she and her husband arrived. Sorry, Charlotte. We’ll aim for better weather next time you visit. Charlotte’s prose and photos make you yearn to visit the gardens she writes about. She has been impressed with the gardens she’s seen in Canada so far – which are often under-appreciated. Never a hero in our own country, eh, Canadians? Our Cabbagetown meeting reminded me of one of our mum’s expressions: that babies come from “under a cabbage leaf.” I’m hoping that under this cabbage leaf is the infancy of a long and rewarding friendship. Interesting use of image. At first I thought cabbage borer but yours is much more pleasant. That's fun. Charlotte and I once tried to arrange a meet up in Dorchester (Dorset) but unfortunately couldn't find a time when we both were free. If only cabbages grew high on stalks and turned their heads sideways (like sunflowers . . . and didn't smell of cabbage . . . how lovely they would be! Carol, Meeting Charlotte was an honour and a privilege. And it seemed the perfect place to do it. Gail, I love the way cities evolve. Cabbagetown has done it in a very nice way. The houses have been rescued and somewhat gentrified, but not in a way that feels exclusive, in the true sense of the word. Being right beside the old Riverdale Zoo, now Riverdale Farm, complete with cows and chickens, helps give it an earthier feeling. Paul, Welcome to the blog. It was a very pleasant encounter. 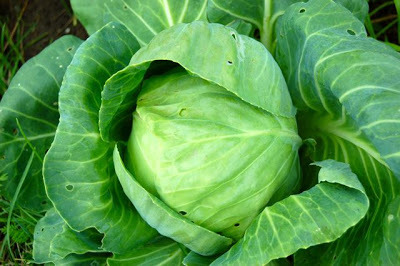 I was glad I had a cabbage photo from our community garden to accompany it. Lucy, I thought the cabbage looked rather rose-like, too. Vegetables can be quite pretty, and outlast the roses, that's for sure. Perhaps one day they'll breed a cabbage for fragrance, who knows! I have always wondered why it was called cabbagetown. Thanks! Helen, I was so disappointed that I was busy when Charlotte e-mailed me, and to think that you were not that far way, bummer. Are you going to the Marjorie Harris talk on Tuesday? Helen, Isn't it great to finally meet people IRL you've only known virtually. I'm hoping for a tweetup in Victoria this fall with some runners/triathletes. Stevie, Thanks for dropping by! Place names are often things we take for granted. It's fun to find out their history. Deborah, I'm sorry we didn't meet up, too. I left a message on your blog about Marjorie Harris. Melanie, It's funny how you can feel so close to people who you've never even seen IRL, as you say. Have fun with your tweet-up. Wendy, Thanks! Sometimes it's hard enough to meet up with people in your own city, never mind the miracle of meeting someone from another continent. I was very happy. I think cabbages are beautiful, so Cabbagetown sounds lovely to me. Meeting a fellow garden blogger for the first time is so much fun (almost as much as meeting them again), especially one who has traveled so far. 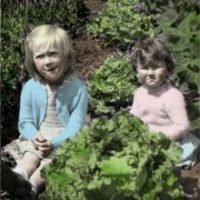 This is my first visit to your blog and I enjoyed this post for its combination of place and history and people and of course cabbages. I envy your meeting Charlotte for the first time, I live in France and most of the people that I tweet to and whose blogs I follow live in Britain and are meeting up at the Malvern Spring Fair in May. What an event that will be and I shan't be there because it is just so far. How nice for you to put a real body to a virtual persona. As for the relative beauty of vegetables and flowers, I love cabbages, especially their spherical-ness (!). We spend ages making box balls perfect and the simple cabbage does it all by itself, every time. And tastes good too. Between twitter and Blotanical and facebook…. I can no longer remember where I've commented or been in touch! Love the way your mind works. Perhaps it's a Canadian way with words (so often I've wished I were Canadian;~D – can I admit that?). Nice article, I've found similar one about Cabbagetown but this one deals also with the history, architecture, Victorian era etc. Worth a look.